The legendary French chanteuse Édith Piaf performed in her lifetime a string of songs that became well known all over the world. Here, interpreting them in their own very special way, pianist Elise Einarsdotter and bassist Olle Steinholtz lovingly explore the treasures of the "Èdith Piaf Song Book". Elise has written two originals in tribute. When I was a small girl, I used to watch and hear my mother listening to Édith Piaf. I understood then that it was exciting, ecstatic and far away in Paris! The Little Sparrow! When now, many years later, I was given the possibility, together with Olle Steinholtz, of interpreting Édith Piaf, my childhood memories were brought back to life and I eagerly took on the task of absorbing and working on the music. What I heard was a frenesi and passion that could move mountains. I heard vulnerability and fragility as well as sorrow and despair on the edge of hysteria. Last but not least….romance….longing….desire….the violent love affairs – true or fictitious – that Édith communicated so strongly. Sometimes as a tender whisper, and at other times like a joyous signal horn!! The titles and the powerful lyrics appeal to me. "Cri de coeur", written by Jacques Prevert, is a favourite, as are the two other stanzas that are printed here. They are often in the form of little short songs, like a series of intensive, glittering jewels. Like so many others, I am moved by the circumstances of Piaf's life, her strong personality, which, besides all the qualities already named, included a large amount of defiance, I am inspired by the rebel! "Je ne regrette rien"! 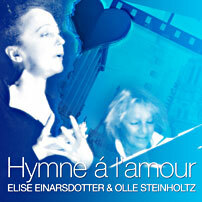 Two of my songs in tribute to Piaf are on this CD, "Hommage á Édith" and "Pour tous ses amants". Piaf's famous credo "Hymne á l'amour" is included naturally, together with many other songs of love. Ni le mal, Tout ca m’est bien égal!